Nowa muzyka na stronie Amiga Remix: Apydia - Meadow's Edge, Turrican 2 - The Wall, Gods (Godless Remix), Apydia - Game Over (Memorial), Varanen, Turrican 2 - The Final Challenge, Turrican 2 - Freedom Rocks, Echoing (2019 Metal Version), Cream of the Earth (Firefox Dirty Drummer Remake vs. Romeo Knight), Lost Patrol (Interlude), Turrican - Cyborg Dragon Remix, Turrican - Victory, Turrican II - The Great Bath i Enchanted Land - The Cave. 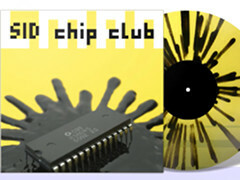 Nowa Kickstarter Campaigne z LMan: SID Chip Club - C64 house & techno muzyka. 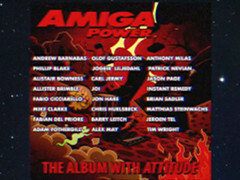 Nowy projekt Kickstarter: Amiga Power: The Album With Attitude. 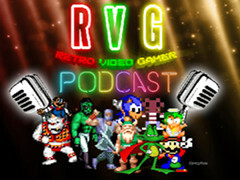 Nowe 8-bit mix podcast z Retro Ravi: House. 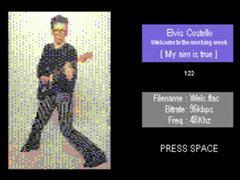 Nowe 8-bit mix podcast z Retro Ravi: Euroscene demo music. Historia muzyki z gier i dema na Amiga. Nowy: Super Tennis Champs, American Gladiators, Alianator, Alcatraz, Airborne Ranger, Air Bucks, Adrenalynn, 7 Colors i Dytec. 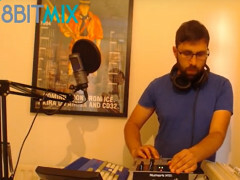 Nowe 8-bit mix podcast z Retro Ravi: Trance Nation. 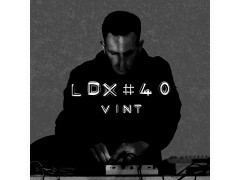 Nowa płyta CD z muzyką od LDX#40: Vint. 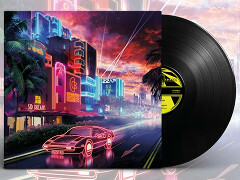 Nowe remiksy muzyki SID: 2018 SID z $11 Heaven, Newsoft II, Arkanoid Remake, Hawkeye, Bruce Lee, Old Men In Used Cars 1, Degenerationskonflikt, OdDnB, Could be Cool, Old Men In Used Cars 2, Unboxed Rubricked, One Knight Stand, A Joint Resolution, Unboxed Intro, Lazy Bytes, Whiteout, Smile to the SkyND i Ben Dalglish Tribute. 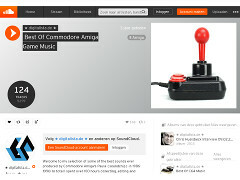 Nowy projekt Kickstarter z Digitalista: SoundCloud - Best of Commodore Amiga Demoscene. 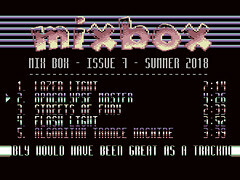 Richard Bayliss - Mix Box: Island Trip, Laser Blaster, Techno Heat, Lovely Creatures i E.C.A Compacting. 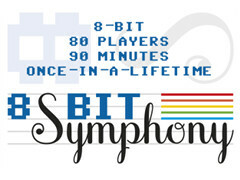 Festiwal muzyczny w Wielkiej Brytanii: 8-Bit Symphony. Aktualizacja dla HVSC (High Voltage SID Collection).Łączna liczba SID są: 51.300. Nowe SIDs: 658 Dzięki zwiększonej: 66 SID. Kredyty: 174. Informacje o modelu / zegara: 27. Zidentyfikowane: 1. Przeniesiony: 26. Nowa muzyka w HVTC (High Voltage TED Collection). Całości jest teraz 630. 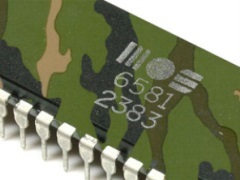 Nowa wersja CGSC (Compute's Gazette Sid Collection). Pliki: 15487 MUS, 4318 STR i 5354 WDS. AmigaVibes-Team podcast Birdie Party 2016: Jingle by JGG - AmigaVibes, RaztoR - Bushido Landeagle, Birdmeister - Rosa Heli, Difzebbe and Kasnek - Clairvoyance, M0onLight - Man ska vara glad, Corpsicle - Endolphins, O - Dark Mason, Mihien - When there is no inspiration there is untz, Hinkik - Time Leaper i Micken - over the hills. AmigaVibes-Team podcast, Amigalloween: Jingle - JGG, Transient - LJ & Virgill 2018, Anatomic Kittens - Extrapurrestrial Impawsibility, Focus Design - Strukton, Techno Choice - Pungas de Villa Martelli, Openoids - Archee, Lemon - Lemonade, Scoopex - Halloween 64K, Sanity - Interference, Translucent World / !Cube, Super Sonic - Craze, Scoopex - Halloween Cracktro i Halloween the 40th Anniversary Celebration Demo - Hokuto Force. 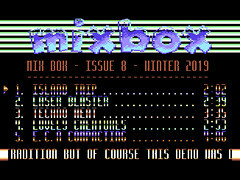 Nowa muzyka na stronie Amiga Remix: Byggsats 13, Xenon 2 Megablast, RSI Megademo - Wastelands, Disconnected, Midnight Resistance, Wolfchild, Oil Imperium, Turrican, Enchanted Lands, Jim Power, Wings, Flashback, RoboCop, Zool Rave, Starter, Elysium, Space Deliria, Stormlord, Leander - World Three i Amegas. Nowe 8-bit mix podcast z Retro Ravi: Underworld, Dreadzone, The Prodigy i Ambassadors of Funk. 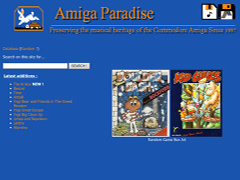 AmigaVibes-Team podcast Assembly 2018 Party: Jingle by JGG - AmigaVibes, Blood Moon 16kb - Byproduct / SceneSat, Inhumanae Chipremacy - Chipremacy, The Derelict - Ephmerix, Rise from the Ashes - Aikapallo, Boot Up Your Retro Warrior Within - GRiMM, Il Portabagagli - Jeff, Attack of the Mutant Projektbeschreibung, Mergente - ITEKI, Your Sunscreen Is Freezing - rawArgon, Synth Vice City - Merlucin, Blues at Alturis IV - Downgone / 242, Distant Thunder - Buzzer / Brainstorm, Summer in Hikikomero - Ihanalammas, Kalja - ukimies i Isidatta - Zardax / Artline Designs. Podcast w język angielski, z muzyką SID. W tej edycji: Ben Daglish. Wideo o Ben Daglish. Ben zmarł 1 października 2018 roku. 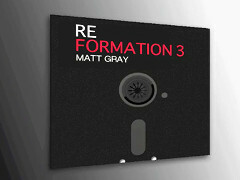 Matt Gray rozpoczął kampanię Kickstarter: Reformation 3. 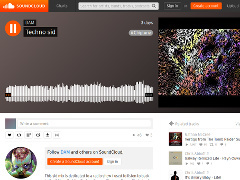 Nowe remiksy muzyki SID: Techno Sid 2 (47:23), Funky Sid 2 (49:26) i Electronic Sid (50:32). 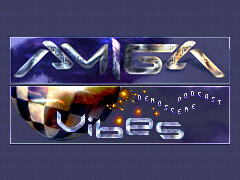 AmigaVibes-Team podcast Riverwash 2016 Party: Jegougou - AmigaVibes Jingle, Szudi / Amnesty - Wizzard II, xtrium / LNX - On the spur, Xandra - IRP, Traymuss / ADDiCT ^ Futuris ^ Implexy ^ Nah-Kolor - Demolition, V0yager - Terminus Prime, X-Ceed - Accelerate, Aeon - Space EX, Shyz - Emotions, musk - Dream Loop, Argasek / Decree [feat. Jakim] - Skylight, Liv / Dreamweb ^ SciVFX ^ Wanted Team - Constellation Lyra, Raf - Mecenas z edytorn undoubtly blasting, Rover - Moze to rzeta z mleka, Jammer - Wanky Rainy Wah Wah, XTD / Lamers - Happy Washing, Dakti - Freed Electron, Le - Grill Party, Skipp / Nah-Kolor ^ Potion -Superscalar, Jakim - Trapped and Willy - Choc niewielu nas zostalo. Nowa muzyka na stronie Amiga Remix: Torvak the Warrior - Level 1, Chuck Rock Theme, Shadow of the Beast, Amegas, SoundLogic, Turrican 2, Stormlord Moonshine Fox, Pinball Dreams i Xenon. 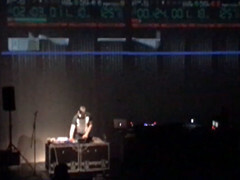 Richard Bayliss - Mix Box: Lazer Light, Apocalypse Master, Streets of Fury, Flash Light i Algorith Trance Machine. 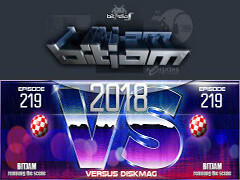 W tej BitJam: 4-mat - Back Again, Aceman - Land of Flying Cubes, Blaizer - Drugstore Cowboy, Bruno - Oneway, Chaser - CyberBoogie, Chromag - Marionator, Curt Cool - Karate Geishas, Dascon & Virgill - Sphinx, Dizzy - Allnite Groove, Dluxe - Radical Insanity, Dubmood - Ninja Starts School, Esau - BlackEnuff, Frequent - Personal Breakdown, Heatbeat - City Lights, Hoffman - Hot Dots, Jazzcat - Boogie Town, Jogeir Liljedahl - Physical Presence, lug00ber - Spaceballs Emperor, Magnar - Rink-a-Dink, Moby - Bounga, Mygg - Mushroom Baby!, Obbe - Stuffbiten, Response - Inside My Brain, Subi - You Can't Control, Tecon - Childhood Glades, Triace - Spring Breeze, Wasp - Retrobution i X-Ceed - Lost. Czas odtwarzania: 1:18:32. Aktualizacja dla HVSC (High Voltage SID Collection).Łączna liczba SID są: 50.700. Nowe SIDs: 473 Dzięki zwiększonej: 811 SID. Kredyty: 1176. Informacje o modelu / zegara: 36. Zidentyfikowane: 12. Przeniesiony: 22. Nowy projekt SID muzyczny od Miloman. 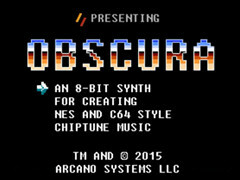 Nowy projekt sprzętowy do muzyki NES, C64 i Amiga: Obscura. 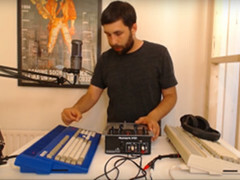 Nowe wideo z Retro Ravi: 8-Bit DJ Setup. Nowa muzyka na stronie Amiga Remix: Lethal Weapon Level 1, Speedball 2 Industrial Remix, Echoing (Remix), Turrican II Level 1 The Desert Rocks Remix, Gods - Into the Wonderful, Hybris Title Music (2018 Chill-out Remix), Lotus Esprit Turbo Challenge - Track 3 (Krull0r remix), Ghouls'n Ghosts - Continue, Turrican - Techno Dungeon (Level 2-2) i Wings of Death. Nowa kampania Kickstarter z Koen De Brabander: SID Dreams. 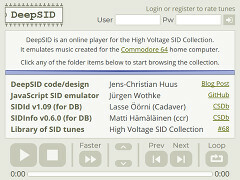 Nowy odtwarzacz muzyki SID on-line: DeepSID. Historia muzyki z gier i dema na Amiga. Nowy: T-Zero (CD32), Perihelion - The Prophecy, Vyrus, Reflexity i Ninja Spirit. Występ muzyczny dla DJ The Formula, 2 x Commodore Amiga 1200. Historia muzyki z gier i dema na Amiga. Nowy: Ninja Remix, Rotox, Revelation, Necronom i Oktagon. 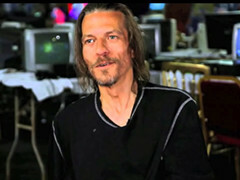 Koncert z muzyką C64 z:Vera van der Bie, Hinse Mutter i Alisdair Pickering. 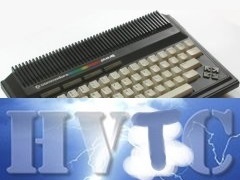 W tym odcinku RVG Podcast: Chiptune Special z Electrocop - Atari Lynx, Black Hornet - Atari ST, Commando - Rob Hubbard - C64, Missile Command 3D - Jaguar, Raiden - Rough And Tumble - Arcade, Shadow of the Beast - Main Theme - Amiga, Time Trax - Title Tune (Tim Follin) - Sega Mega Drive, Turrican II - Main Theme - Amiga, Xenon - Amiga i California Games (Surfing) - Atari Lynx. Podcast w języku szwedzkim, z muzyką SID. 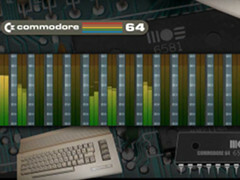 Nowy odtwarzacz muzyczny do Commodore C64: 48Khz HiFi digi player. Historia muzyki z gier i dema na Amiga. Nowy: Ringside, Pro Boxing Simulator, Ballistix, Nitro Boost Challenge, Metal Masters, Laser Squad, Airline, Globulus, Gemini Wing i Hawk Eye. Nowa muzyka w HVTC (High Voltage TED Collection). Całości jest teraz 608. Nowa muzyka na stronie Amiga Remix: Panza Kick Boxing Intro - daXX Remix, Space Debris - daXX Remix, Occ-San-Geen - daXX Remix, Nebulus (Walkthrough Remix Radio Cut), Lethal Weapon - Level 1, Turrican 1 - Level 5, Apprentice (Piano a go go), Signia 2018 Remix, Clown-O-Mania, A Prehistoric Tale - Title Theme, Grand Monster Slam - Title Theme i Xenon 2 - Megablast (2017 Oldschool Mix). 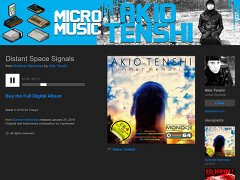 Nowy album muzyczny Summer Memories od Akio Tenshi: Distant Space Signals, Chinese Restaurant, Weather, Lost Friend, In Da House, Uncertain Plans, Summer Memories, Hot Style Intro, Colourless, Hexadragon, Trackmo Final i Magic Afternoon. 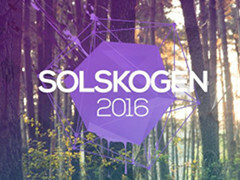 AmigaVibes-Team podcast Solskogen 2016 Compo Nuskool: jingle, gloom - T-808, Nainain / Resistance - The Moon - High Orbit, Bitbear featuring Modulo One - Pixel Perfect, Hansee - Music for Nerds, Proper dISCO - Roku Shi, T-101 - Escape, INVESTOR! - Poison, phobium - Minute Man, xeche - 7.5 x 253, Xerxes - In Bed with Leo, corpsicle INSAne ^ - Taktlos i RbR - Worst Played Intro Ever Reggae. Nowa muzyka na stronie Amiga Remix: Gods - Into the Wonderful, Wings of Death - Level 2, Stardust Memories (MDK remix), Memorial Theme (Before and After) i Cousin's Song (Megaforce). Nowa wersja CGSC (Compute's Gazette Sid Collection). Pliki: 15441 MUS, 4319 STR i 5348 WDS.